The wind genny man came out early this morning and we are ready to go. I am going on ahead as this will let Tim go astern to the water point. 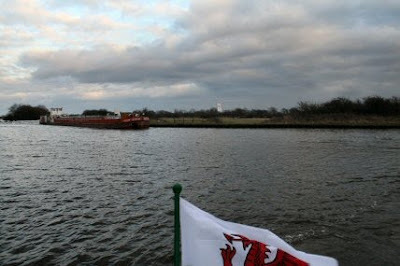 I waited for his arrival at the first swing bridge which I opened and he closed behind me. It was a steady trip up the New Junction. Cold but at least it is not raining or snowing as it was earlier. 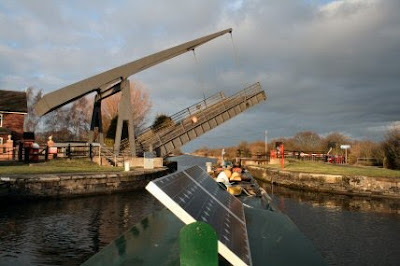 The last bridge and the foot bridge at the end of the Junction just visible on the horizon. Lots of birds to be seen on the way up. A number of Herons and Crested Grebe. The usual birds plus a Jay and a Cormorant - still no Shag. 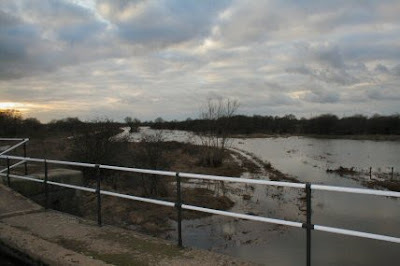 There is still plenty of excess water to be seen off the top of the aqueduct. I came to the end and checked the canal to the left and there was nothing coming. Checked to the right but there are a lot of trees in the way. As I got right to the corner I spotted a large bow coming up. 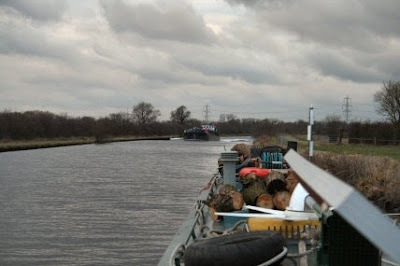 Full astern and pulled in to the bank. As I pulled in the ship gave a blast and indicated it was coming into the Junction. Within the next half mile the bows started to lift and around the corner came the Rix Owl. I moved in to the bank but as the ship came closer the water level drops and the rocks that the bank is made out of look awfully close. The Rix Owl slows down and the water level rises. 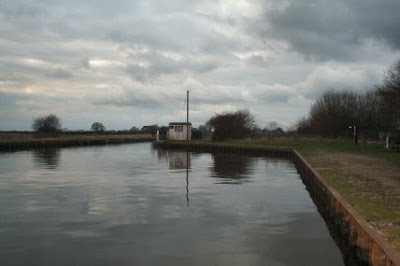 Reached Pollington and moored just before the lock. Another large vessel went passed after dark. Not sure which one but it was one whose name ended in stone.